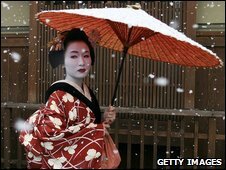 Japan's famous geisha have reportedly complained of harassment from tourists, prompting local residents to patrol the area to protect them. Geisha claim they have been pursued by visitors grabbing at their sleeves and wanting to take their photographs. Residents and local business owners in Gion, the Kyoto district where most geisha live, have now volunteered to guard the streets to stop any trouble. Nearly 50 million people visited Kyoto last year, more than any previous year. For many tourists, catching sight of a white-faced geisha in her beautifully embroidered kimono on the streets of Gion is one of the highlights of a trip to Japan. But geisha are an increasingly rare sight; where once there were more than 80,000 across Japan, there are now just 1,000. Wearing their traditional silk kimonos and high wooden sandals, the geisha that remain do not welcome being pursued as they travel between teahouses carrying out their daily tasks. According to Japanese media, local government research shows that geiko (fully-fledged geisha) and maiko (apprentice geisha) are often surrounded or pursued by groups of tourists. "Some tourists seem to have the impression that Gion is a theme park, and geisha and maiko are walking the streets as part of a performance," an official of Higashiyama ward office told the Yomiuri newspaper. An 18-year-old maiko told the newspaper that people silently approach her "and suddenly stand beside me to have photographs taken, so I get taken by surprise". In response to this, local residents and restaurant owners have volunteered to patrol the neighbourhood several times a week. They will intervene if a tourist is behaving in an inappropriate manner, the newspaper says.